Firefighters enveloped in foam after a fire suppression system released at a Philadelphia substation. 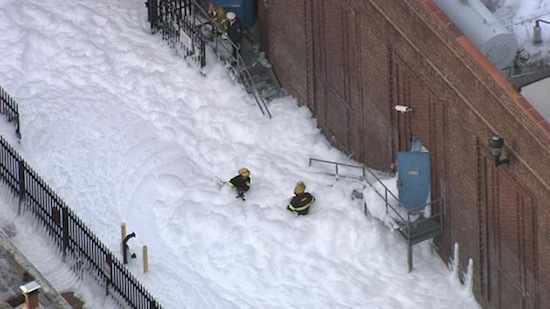 A massive amount of foam covered an entire Philadelphia city block Saturday after it leaked from a local power company’s substation. After people heard explosions inside a building around the 400 block of South Juniper Street at 1 p.m. Saturday, police started receiving calls. HazMat crews arrived to the find the fire suppression system had released a large amount of foam. There ended up being a problem at a PECO substation, which caused a power outage, and then the foam began appearing. “There was a fire alarm going on and I didn’t really think anything of it, and then I was just chillin’ in my bed and I heard this huge explosion,” said Philadelphia resident Mark Deluca in a published report. “Then all of a sudden what looked like giant soap bubbles started floating down in front of our house,” said resident Karen Saillant, in the same report. At this time, fire officials say they’re still investigating exactly what happened inside the substation. We’re told the foam system inside triggers to prevent any fire from spreading, and that it fills up the entire building immediately. That’s why when crews first opened the doors it came gushing out, in some places 6-7 feet high. There are no reports of any injuries to residents or firefighters. PECO officials said 2,500 customers temporarily lost power. It has since been fully restored. As a result of the power outage, there were several elevator rescues in the area. Fire officials say they pushed the foam and washed it away into the sewage drains, and it is not toxic or environmentally harmful.